By the 2400s, the USA has been torn apart by natural disaster, war, and ideology.From of the ashes of the southern and western United States have arisen two new nations: Middlechris and the Kali Union. In this post-apocalyptic tale, a simple Kali bookstore owner, Franco Leon, discovers that an old friend, Juan Olofson -- the leader of a rebel force called the Tiger’s Paw Army -- has been imprisoned by a ruthless regime known for torture and mutilation. Franco steps out of the bookstore and into a savage war zone to embark on a journey fraught with peril and uncertainty. With his new Tiger's Paw comrades, Franco ventures into Middlechris in an attempt to rescue Olofson before his execution -- and before Kali falls prey to tyranny. 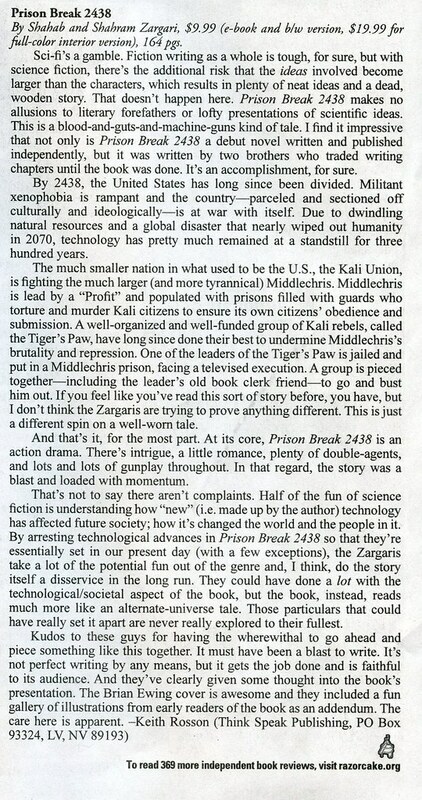 "At its core, Prison Break 2438 is an action drama. There's intrigue, a little romance, plenty of double-agents, and lots and lots of gunplay throughout. In that regard, the story was a blast and loaded with momentum."